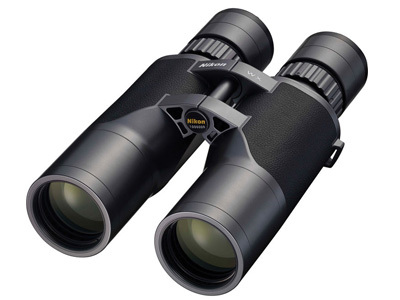 The culmination of a century of experience, Nikon's 7x50 WX IF Binocular brings together a wide array of technologies and materials to produce an optic that is engineered to provide outstanding performance for astronomy, birding, or nature watching. Optically, the WX utilizes phase-corrected Abbe-Koenig prisms, extra low-dispersion lead and arsenic-free glass, and broadband fully multi-coated optics that work together to correct chromatic aberrations and astigmatism, render colours accurately, and improve: brightness, sharpness, and clarity. Added to this impressive performance is a field-flattener lens system which eliminates distortion across the entire ultra-wide field of view — especially at the edges. Its moderate magnification provides a generous field of view that brings subjects in close for detailed observations while mitigating the distracting hand-shake common with higher-power optics. To ensure the sharpest views possible, the WX is built with a helical focusing mechanism on each individually-focusing eyepiece. Eschewing the conventional centre focusing system not only allows precise focusing for any user, but it also ensures the integrity and longevity of its waterproofing. The helical mechanism moves the eyepieces forward and back without rotating the eyepiece lenses, maintaining a centred optical axis that enables even more clarity and sharpness. An exceptionally wide exit pupil completely covers fully dilated pupils in dark or low-light conditions, while the long eye relief and six-position twist-up eyecups ensure that even while sporting eyewear, users can enjoy the exceptionally wide field of view without vignetting in all lighting conditions for an immersive observational experience. Thoughtfully designed for comfort and durability, the chassis is made of a lightweight and impact-resistant magnesium alloy that is wrapped with a slip-resistant protective rubber armour. Ergonomically positioned textured palm pads improve grip and in-hand comfort. To withstand extreme environmental conditions, the optical tubes are nitrogen-filled and O-ring sealed to be waterproof and resistant to internal fogging. For a more comfortable fit in the hand, Nikon employs the Abbe-Koenig prism configuration, which allows for slimmer optical tubes versus conventional roof prisms — without sacrificing performance. The elongated prisms also distribute the weight more evenly to give it a comfortable balance. Weighing in at a hefty 5.3 pounds, some users may experience fatigue while holding the WX during long observation sessions, so Nikon includes a tripod mounting adapter that was specifically designed for this chassis, and attaches to tripods and heads via a 1/4"-20 mount. For safe transport and storage the WX comes with a hard carrying case outfitted with a custom-cut foam lining to hold the binocular and accessories. Interpupillary Adjustment	58.0 - 78.0 mm / 2.3 - 3.1"